I’ve just added a feature in the latest internal to the Campaign Editor that allows campaign designers to specify if an endorser will only endorse a candidate who has a certain issue position(s). Here’s a screenshot from the Editor’s Endorsers Screen. 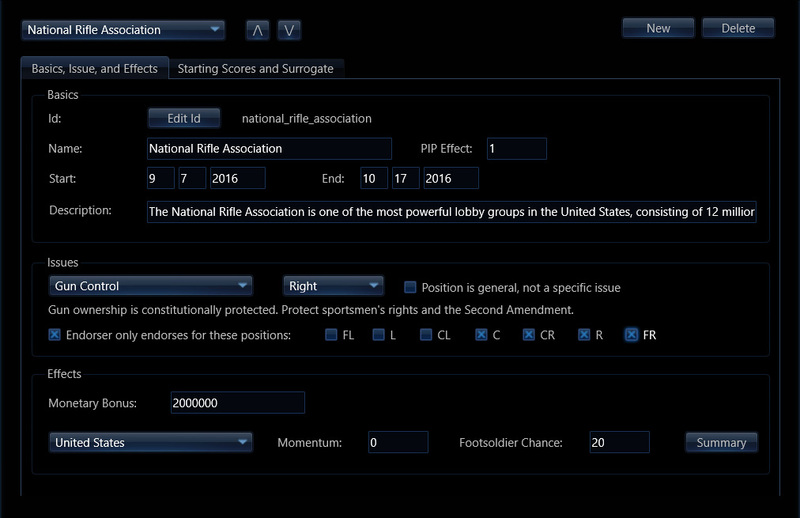 Here you can see the NRA is set to ‘Endorser only endorses for these positions’ and the positions are specified as Centre, Centre-Right, Right, and Far-Right. This will help campaign designers control which candidates an endorser will endorse. Thank god! This is a massive improvement for historical scenarios. When do you expect to include voting demographics? Voting Blocs Spring or Summer 2019. I really find this improvement useful! I love the direction the game is going in! I just have a question, what incumbency features do you intend to add? Thanks for this feedback! No incumbency features have been decided at this point. After the Spring 2019 release I’ll be looking seriously at that. A really cool addition! This will hopefully help with some whacked-out endorsements (like Cheney endorsing Warren IN THE PRIMARIES) or something. Is there a potential for losing an endorsement if a candidate changes their issue position? For example, a pro-life Republican getting an anti-abortion endorsement in the primary but then becomes pro-choice in the general? I’m continuing to get an EEFACE crash 100% of the time, even after updating to 2.94. This is while playing VCCZar’s 2020 campaign, which seems to work for other people. I turned autosave off but continue to crash. I have an idea for better presentation of election day. It would be cook if the results came state by state like on the news. This wouldn’t be too unlike primary results in the game. Whenever a state is called, a pop-up comes up with the candidate faces and the popular vote won and the electoral votes won and with the total EC and PV up to that point. State-by-state is on the to-do list. Ok, then this isn’t the save error other people have reported. Thanks for this link – I will look into this.